In 2001, Ed Keeter, a Freightliner Trucks factory shift manager and Vietnam War veteran, proposed the idea of decorating a truck in military decals and showing it off at the local veteran’s hospital to honor U.S. veterans. Freightliner’s employees loved the idea so much that it grew into what we now refer to as the Ride of Pride. Each year, a trucking company is awarded with a new military-themed truck for the Ride for Freedom procession through Washington, D.C., which occurs each Memorial Day. Schneider was awarded its first Ride of Pride truck in 2007 — the sixth in the program’s series. Since then, Schneider has been honored with nine additional trucks — 10 total — which include the only two Canadian military-themed units ever produced. These impactful trucks resonate with the motoring public, military members both past and present and, of course, the military members who are selected to drive and represent the truck for a full year. Manning the wheel of these rolling tributes is a very personal experience, resurrecting memories from the driver’s time in the service while serving as an ambassador for other servicemen and women. There may be 10 different trucks and 10 different journeys, but Schneider’s Ride of Pride drivers share one overall sentiment: It’s an honor that’s heartfelt and resonates to a person’s core. The Ride of Pride goes beyond driving a specially decorated truck — it’s about sharing a common experience and paying homage to those who came before and those who will come after. Schneider is proud of its military legacy and will to continue to be military strong. We convert military experience to Schneider experience. Fill out our Military Pre-Qualification profile and see what driving positions we have available. 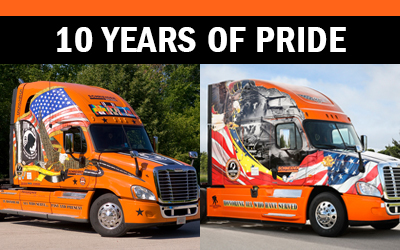 How have Schneider’s Ride of Pride trucks impacted you? Schneider Guy loves the “Big Orange.” He’s passionate about the trucking industry and connecting people to rewarding careers within it. He’s been the eyes and ears of our company since our founding in 1935, and he’s excited to interact with prospective and current Schneider associates through “A Slice of Orange."